Paranormality: And a good time was had by all . . .
And a good time was had by all . 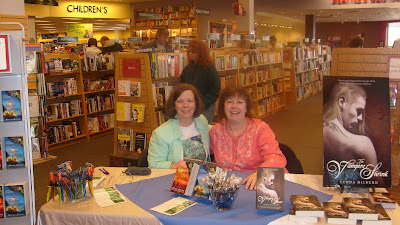 . .
Melissa Mayhue and I had a wonderful time yesterday, meeting, greeting and signing books at Borders Books in Longmont, Colorado. It was a grand day! Will you ever come to Detroit? Hey, Judie! I was raised in Detroit, and I lived all over Michigan for years. My brother (the lead guitar player) still lives in Lansing. There's a strong chance I'll be doing book signings in Michigan at some point. I'll keep you posted! Thanks for asking. THE VAMPIRE SHRINK book giveaway! !